Give your skin an energizing boost with this ultra-refreshing blue agave mask. An Energy Complex of green tea, ginseng and Vitamin B helps stimulate the skin’s natural metabolism for the look of plumper, hydrated and refreshed skin. The cooling sensation and uplifting scent will leave your skin feeling totally revived. Apply a thick, opaque layer to clean, dry skin avoiding eye area and lips. Leave mask on for 15-20 minutes or until completely dry. Gently peel off mask in a downward motion from the outer edges and rinse off any residue with warm water. Follow with Ceretin Serum and Soak It Up. Can be used 2-3 times a week. 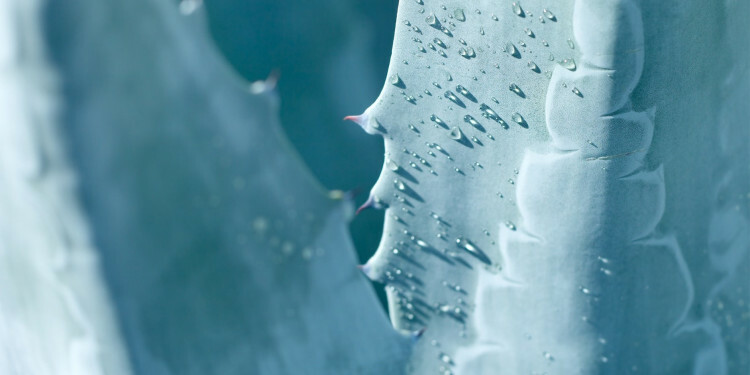 Once the Blue Agave Mask dries on the skin, stretch your facial muscles to loosen the mask. This will help you peel the mask easily away from the skin. This mask has made a huge difference with shrinking my pores. I had enlarged pores do the teen acne and I have seen amazing results! I really enjoyed this mask. It’s smelled good and worked well. Only problem is, I’m pretty sure I used almost half the bottle on just one mask. So I probably won’t purchase this again for the sake of value. I used this mask one morning before work because my skin was looking a little dull. It was instantly cooling and felt great. It was really easy to peel off and left my skin looking fresh. A new favorite! I’ve used this mask a few times now and I’m very happy with it. It didn’t irritate my sensitive skin and I love the tingles—it definitely lives up to the “envigorating” claim. My only complaint is that its pretty difficult to spread without a brush (which is obviously how they suggest you apply it, so they can’t be blamed for that) and even with a brush you end up using quite a bit of product each time. I’ve used it about 3 times and I feel like I’m at least halfway through the bottle, which isn’t great considering the price. But it feels very luxurious and has a nice, light scent that makes it feel like you’re being pampered so I’d buy it again. WOULD RECOMMEND! A verysmall amount of product for the price. Would not purchase again. Love The Way It Tingles! This feels soooooo good! It's the perfect Saturday morning mask while you're drinking your coffee... so hydrating and refreshing. It's a staple in my weekend skincare "treat yoself" routine! I feel like it gets all the stuff out of my pores. I've tried diff charcoal masks that have a similar effect, but this one is better. And, wearing it is more pleasurable because it smells good and it has this really nice tingle effect. This product is amazing! I love the way it made my skin feel after the first use. Would highly recommend! I got this at Ulta as part of a complete overhaul of my skincare routine. It says to use a thick layer (so you can peel it off later), and there's not a ton of product in the bottle/tube. I think I'll have gotten 5-6 uses out of it? It has a very strong minty sensation (like when you take a sip of ice-cold water after just brushing your teeth) that doesn't go away until it's at least 50% dry, which is a good 5+ minutes. Usually takes 15 minutes for it to completely dry on me. After peeling, my skin looks fine, but no noticeable changes that I can see. So, it's nice, but not something I would spend that much money on. I was super excited to get this mask originally. I tried it the first two times and it feels as if its burning my skin. it doesn't leave my skin red or anything but it doesn't feel nice when I'm wearing it. I don't think I will be trying it again. I got the product because Pur is supposed to be natural and good for the skin, but this product doesn't agree with me.